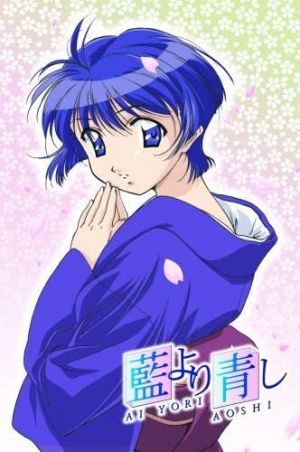 Ai Yori Aoshi (藍より青し) is a manga series by Kou Fumizuki that was adapted into an anime series by J.C. Staff. Tina Foster strips and uses a Bathroom Scale just before Off Screen Bathing. Kaoru Hanabishi takes an Off Screen Bath. Chika Minazuki takes an Off Screen Bath after getting wet. She tries to get Kaoru Hanabishi in with him but Mayu Miyuki tells her that she will be the one to take a bath with him. Aoi Sakuraba takes an Off Screen Bath. Afterwards Chika Minazuki takes one off screen. Chika Minazuki invites two classmates over to the mansion. While cleaning up the bathroom in maid outfits, they fall into the filled bathtub and get drenched, so they decide to have a proper bath once they're already there. Due to Chika's clumsiness, Kaoru accidently gets to see the girls naked. Tina Foster finds a picture of her and Aoi Sakuraba in Bathrobes after some Off Screen Bathing at an Onsen. Later on, Mayu Miyuki is seen wearing a bathrobe eating some cake after taking an off screen Bath just as she gets a phone call from Tina inviting her to join them on their trip to Kyushu. While temporarily staying at Mayu Miyuki's mansion, Chika Minazuki takes an Off Screen Bath in her Bathtub saying that the bath was wonderful but misses the big bath. Mayu said that she could easily tell that Chika was faking being happy and that she was actually crying while she was in the tub because of the current circumstances. Kaoru Hanabishi lets Aoi Sakuraba use the bath in his house after letting her stay for the night. She goes behind the screen into the changing room and starts Stripping while Kaoru hears and tries to look back at the silhouette of her stripping through the screen. In Kaoru's bathroom, Aoi is seen in a Furo session pouring water onto herself from a Bath Bucket. Later it shifts to her settling her body into a Unit Bathtub and afterwards tears are seen dropping from her face into the bathwater. Kaoru peeks his head into the changing room where he asks Aoi if she is ok which she says yes and Kaoru gets a glance at her neatly folded clothes with her underwear and bra on top. Back in the bath, as it shows Aoi Leg Curling, she then Water Scoops water onto her face. It then turns out that she was crying out of joy of finally being reunited with Kaoru and the episode ends continuing the scene into the next episode. Continuing from Aoi Sakuraba's Furo session from the end of the previous episode, she is now seen humming in the Shower as she has a flashback of a moment from her and Kaoru's childhood. As Kaoru Hanabishi can hear Aoi humming from outside the bathroom, he says to himself that he remembers that song from his childhood. As Aoi comes out of the bathroom, she is wearing the under portion of her Yukata and drying herself with a light green towel saying that she had a wonderful bath. Kaoru having a bath that Aoi prepared for him. After having Aoi's cooking, Kaoru is seen having a bath that Aoi prepared for him in his Unit Bathtub. In the bath he thinks to himself that she had been doing a very good job and works hard to impress him. He then jokingly has a Dream Sequence of Aoi coming into the bathroom naked to join him and scurb his back. When Kaoru comes to the conclusion that even she wouldn't go that far, he hears a knock on the door and Aoi saying that is it ok if she comes in and scrubs his back which surprises Kaoru and the episodes ends continuing the scene into the next episode. Shoujo Hatsunetsu - both created by Kou Fumizuki. Umi no Misaki - both created by Kou Fumizuki. This page was last modified on 15 February 2017, at 17:27.